I work three part-time jobs, go to school two nights a week, I blog,I belly dance, and I have family obligations. Any way you look at it, I keep really busy. So, on those nights when I feel completely knackered this recipe makes it all better! Not only can I get a home cooked meal on the table within 45 minutes, I can do it with minimal stress, mess or any tears. That is always good! Aside from being easy to prepare, this is not a calorie buster, but it tastes like it is. Let’s face it, comfort food is not exactly figure friendly. 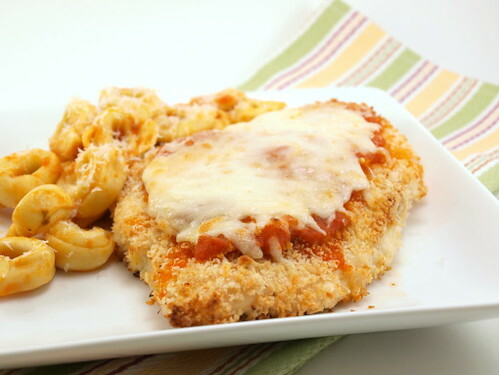 This dish offers up warm, cheesy, crunchy, tangy comfort without a lot of the guilt. 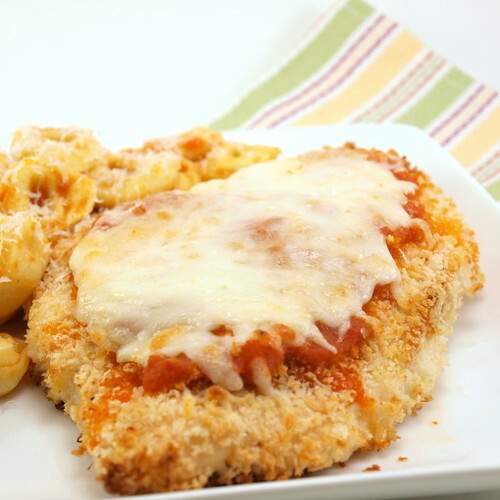 You can use any tomato sauce you like in this recipe. 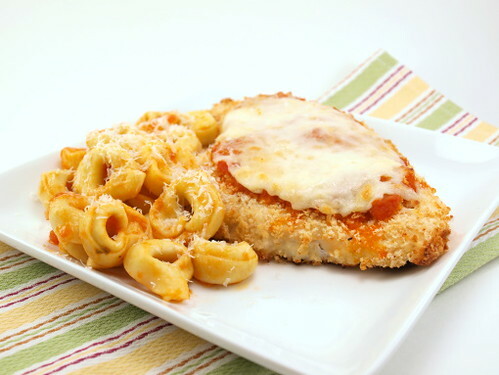 I happened to have some left over in the fridge, and it was lovely, but if it makes your life easier to use sauce from a jar or from another favorite recipe go right ahead. Heat the oven to 450 F and spray a foil lined baking sheet with non-stick cooking spray. 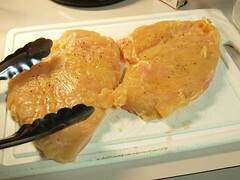 Pound the chicken breasts until they are 1/2″ thick. Season both sides with salt and pepper. In a small bowl whisk the egg white until frothy. 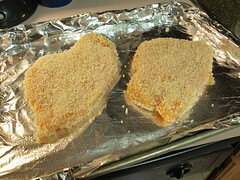 In a second bowl add the panko bread crumbs and season with salt. 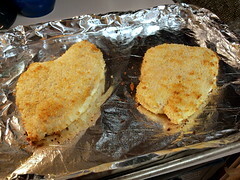 Dredge the chicken first in the egg white, letting the excess drip off, then coat in the panko mixture. 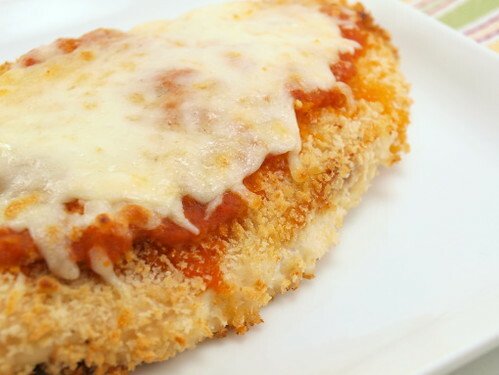 Let the chicken sit for ten minutes at room temperature so the crust can set. 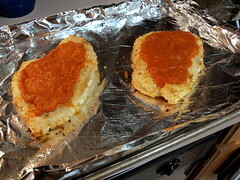 Bake for 20 minutes, or until the chicken reads an internal temperature of 155 F. Remove the chicken from he oven and spread the tomato sauce on the top. 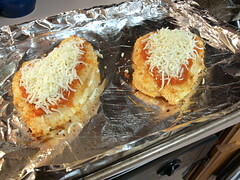 Next, add the cheeses and return to the oven for ten minutes, or until the cheese is melted and starting to brown and the chicken reads an internal temperature of at least 160 F. Remove the chicken from the oven and let rest five minutes before serving. While the chicken bakes cook the pasta according to the package directions in very salty water.